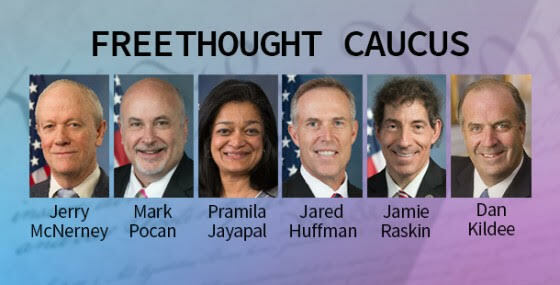 FFRF was so pleased this spring, when several representatives announced the formation of a Congressional Freethought Caucus. It will focus on promoting secular values and will give a voice to freethinking voters, something we desperately need right now in Congress! Current members of the new caucus include Rep. Jared Huffman, D-Calif.; Rep. Pramila Jayapal, D-Wash.; Rep. Dan Kildee, D-Mich.; Rep. Jerry McNerney, D-Calif.; Rep. Mark Pocan, D-Wis.; and Rep. Jamie Raskin, D-Md. Please urge your representative to join their lead.